October 19 -- Guildford Coal Limited (Guildford or the Company) (ASX: GUF) is pleased to advise that the Company remains on track to deliver all aspects of the 2015 strategic review, both on a corporate level and on an operational level in Mongolia and Queensland. A critical aspect of the Company's recent activities has been the evaluation and active pursuit of several funding alternatives to enable a restructuring of its existing debt facilities (the Restructuring). In this regard, the Company continues to maintain a strong and supportive working relationship with its existing financial backers to allow requisite time to complete the Restructuring. Guildford has reached agreement with a strategic Chinese investor for a share placement for AUD$7 million, which will involve the issue of 583.3 million ordinary Guildford shares at a price of AUD$0.012 per share to SPG Investment Holdings Ltd (SPG). The placement is conditional on, inter alia, completion of the Restructuring and is subject to shareholder approval. Details of Notice of Meeting will be sent to shareholders in due course. The agreement followed extensive due diligence by SPG, culminating in a physical inspection of Guildford's BNU Coking Coal Mine in Mongolia, which showcased Guildford's ability to develop and operate a world-class coking coal mine in the South Gobi desert and to produce a high quality hard coking coal product in close proximity to a large number of Chinese steel makers operating in northern China. Whilst the agreed price is at a discount to Guildford's current share price, it is the Board's view that this should be seen as a significant and strategic opportunity for the Company to secure a very large and well connected Chinese group on the share register to support the expansion of coking coal operations in Mongolia and in particular through the expansion of the market for the BNU hard coking coal in China and through pulling costs out of the supply chain to Chinese end users. SPG is part of a group of companies controlled by Mr. David Wang, 51, who is the Honourable Chairman and board member of Greenland Hong Kong Holdings Limited (Greenland HK) which was formerly known as SPG Land (Holdings) Limited (SPC Land). This entity was listed on the Hong Kong Stock Exchange in October 2006 and was involved in real estate projects over ten cities in China. Mr Wang is the founder of SPG Land and was the chairman of this group, engaging in real estate development, property investment, hotel investment and related business in China. SPG Land changed its name to Greenland HK in August 2013. Mr Wang is also the Chairman of Peninsula Shanghai Hotel, one of the top luxury hotels in China and Asia. Mr. Wang has over 20 years of experience in finance, construction, property development and investment. He graduated from South China University of Technology with a Bachelor degree in Building Materials and University of Technology, Sydney (Australia) with a Bachelor degree in Commerce and now holds an Australian Passport. Mr. Wang enjoys a strong reputation and has considerable influence in the commercial, banking and real estate sectors in China and Australia, as well as academic circles. In recent years, he has devoted his efforts to promote the friendly cooperation between China and Australia in economic, banking and academic areas. Mr. Wang has a deep understanding of real estate investment. Through Mr Wang's extensive business success he has created a strong network in China in the coal and steel sectors with both private and state owned entities. · A variable component of the interest payments linked to actual coal sales. The structure contemplated should give the Company significantly greater flexibility to manage its cash flows going forward and enable the implementation of the growth strategy. The Company has made significant progress towards the completion of this restructure and will update the market when it has been finalised. Guildford continues to investigate actively the merits and mechanisms for a potential listing (dual and/or sole) on an Asian stock exchange (the Potential Listing). This was a crucial recommendation flowing from the 2015 strategic review of the Company. Shareholders are advised that there is no certainty or assurance as at the date of this announcement that the potential Asian listing will proceed or be completed. The Company will make the necessary announcements when there are further developments. October 16 (FMG Funds) Mongolia remains a true frontier market in many ways. This was displayed in August when global stock markets plunged and the MSE Top 20 was one of the few stock markets in the world not showing correlation. 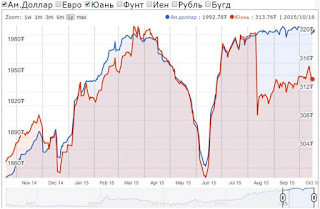 On the other hand, sentiment towards Mongolian assets remained sluggish with the Tugrik continuing to depreciate as copper (its top export) prices drifted lower. 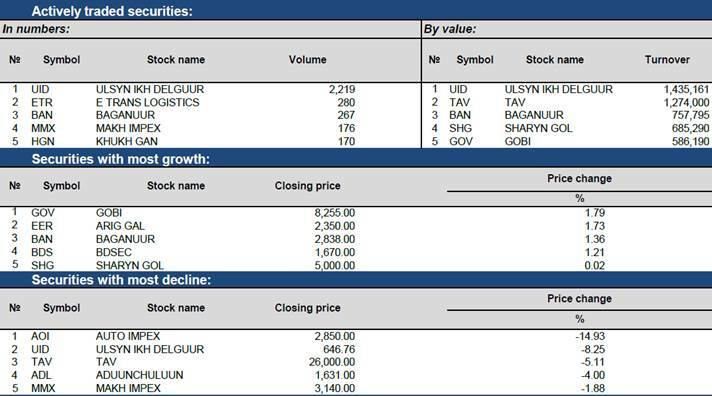 The local stock market was muted while further heavy drops were seen in the off shore listed Mongolian equities. We bought into the market on dips as valuations are looking attractive. Last quarter's resolution of the development of the major copper and gold mine, Oyu Tolgoi (OT), failed to change the sentiment towards Mongolian assets. However, Rio Tinto says it remains confident in the long term prospects of copper productions and is looking forward to finance the second phase of the OT mine, despite a slowdown in the Chinese economy and the fall of global commodity prices. When it becomes fully operational, the OT mine, which is one of the core holdings of the Fund, is expected to account for one-third of Mongolia's economic output. An announcement of the OT underground mine financing deal would give further support to Mongolian assets and pave way for long term positive returns. Although most data points are negative, one should remember that Mongolia is a small market and it doesn't take much to move this market (the MSE Top 20 returned +174% in 2010). October 16 (MSE) By the Resolution No. :380 of Financial Regulatory Commission dated on 13 October 2015, the trading right of "KHAABZ"JSC has been reinstated. October 16 (MSE) During the special meeting of Financial Regulatory Commission on October 13, 2015; Mongolian Stock Exchange was decided to become a self-regulatory organization. As MSE becomes a self-regulatory organization, MSE will be able to set its own standards and requirements for the listed companies; furthermore, it will able take action against unqualified companies. Also, MSE can work with international stock exchanges and other international organizations to develop capital market. October 16 (gogo.mn) The council next to PM's office introduced "Implementation of Economic Transparency Support law" and group of laws on Tax environment reformation, and exchanged views on the matters. P.Tsagaan, Head of Presidential Office, also attended the meeting and discussed about business initiatives and difficulties suggested by residents in eastern provinces. "Legal environment of tax and its financial reporting system had been previously amended three times until 2007. Thus we now plan to make number of changes into the law, considering today's circumstances", said Chief of Tax Authority B.Ariunsan. The amendments to be made include: online tax reporting system, reduction in high amount of fine and interest, separation of tax-related crime from economic crime, cancellation of reporting to police authority, elimination of number of steps in inspection process, changes in amount of taxes and other issues. Members of the economic council requested clarifications from Prime Minister on several matters and exchanged views, which include; supporting new business activities by not imposing tax for first three years, promoting positive results of works discussed and finalized at "Decision Time" of the Government, and replacing VAT with 'trade tax". Moreover, Banking Association made following requests; "Focusing on strengthening security matter of current account and reporting to law enforcement authorities only in case of being confirmed by the account owner", "Not imposing tax on revenues coming from saving account" and "the amount of savings in commercial banks have been greatly reduced so that imposing tax on savings revenues might event trigger customers to draw their money from banks." There are other suggestions such as; transparent tax reporting can be done by indexing all legal entities and registering through revenues and expenditures services, whilst integrated reporting of state revenues and expenditures can be centralized in single database." In addition, the ceiling amount of tax to be imposed on big companies can be set. It has been very risky for investors to be involved in mega projects, so that it is better to separate municipal tax policies from the projects. The council next to PM's office holds monthly meeting and discusses facing issues, policies and decisions. In order to provide information to the economic council and improve work-flow between parties, economic council's working group was established. The working group consists of experts who have previous experience in World Bank and International financial organizations, said PM. Future of Mongolian economy depends on achieving "new balance"
October 16 (gogo.mn) In regards to the discussion over the draft law of 2016 main guidelines towards state monetary policy, we deliver the short interview with Director of Mongol Bank's Monetary Policy and Research Department D.Boldbaatar. In scope of the monetary policy, there has been a talk of macroeconomic balance. How should we perceive it? First of all, we should understand that economic conditions have been changed drastically. We are now obligated to transform current economic structure which was formed solely on mining sectors and reliant on prices of commodities. During the period of mining boom, we set big goals such as mega infrastructure projects and also directed the state budget policies mainly towards social welfare. But we are currently facing challenges to create an economic growth in new environment of macro economy. Then it is called as new balance of macro economy, referring to implementation of macroeconomic policies in order to shift the economy into new balance. What steps should be taken in order to shift into new balance of economy? That what has changed so far is crucial. Firstly, we must now amend the state budget initially designed based on the mining boom. It is necessary to approve the state budget which must be reduced and deficit free. We do not have an option to take such approaches because we are facing difficulties of external debt. Secondly, the country's economic conditions just follow changes in mining sector due to its high dependency. Such ups and downs in mining sectors force us to make right adjustments swiftly in major polices and implement them efficiently. Thirdly, all countries highly dependent on mining sector have been struggling lately and witnessing downturn in export sector. We have same situation and struggles as they do, so that we might develop a value chain in agricultural sector and create new products in order to recover the export. It would be fundamental to reach our goal of reform. Lastly, another issue we currently encounter is that revenues coming from foreign markets have been decreased. Then, we must accumulate money to invest into expanding local economy and should focus on domestic manufacturing. When is the new balance of economy expected to be fulfilled, according to Mongol Bank? There is no certain timetable, which is impossible to be set. Economy itself is driven towards new balance. But the result is crucial. If we adjust our policies efficiently, we can reach our goal within a short amount of time. What are expectations over new balance of economy? We expect to create the diversified economy which is less dependent on external factors such as world economic transitions. But we had set such objectives previously, so that now we should be more aggressive and specific to make it reality. October 16 (MIBG) As we write this, the USD/MNT rate is trading for 1,986-1,995 at Mongolia's leading commercial banks. Meanwhile, the Mongol Bank is desperately trying to keep the USD/MNT rate below the critical psychological point of 2,000 MNT. This week alone the BoM supplied Mongolia's money market with 6.1 million dollars at 1,993-1,994 during two auctions (October 13th and 15th). We believe the BoM is determined to hold the USD rate below 2,000 and will continue to intervene in the money markets for the remainder of the year. One notable macroeconomic factor that may help the BoM cushion further depreciation of the MNT is Mongolia's international trade activity. During the first 9 months of 2015, Mongolia's total foreign trade turnover was 6.4 billion USD, which is down 20.7% compared to the same period of pervious year. More notable is that imports during the first 9 months were down by a staggering 29.4%. Mongolian businesses as well as households are consuming and investing less, hence decreasing the demand for foreign currency. That said, winter is coming, and we continue to believe that the USD/MNT will exceed the 2,000 mark before the end of 2015. 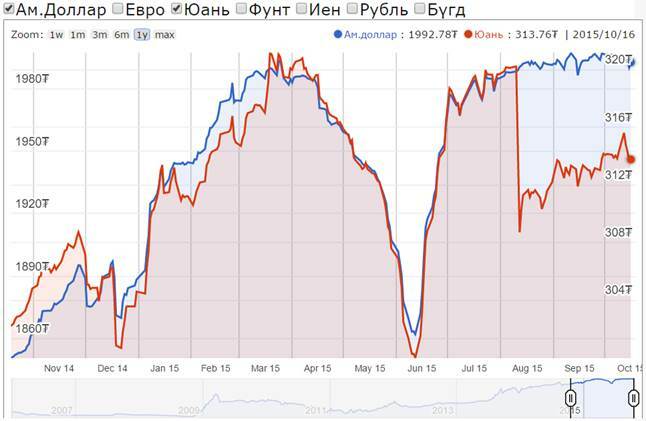 This will be driven by even further weakening of FDI and weaker pricing for Mongolia's major export commodities. As of this week, the General Taxation Authority of Mongolia suspended financial transaction activities of 8,418 legal entities. The spokeswoman of the GTA stated that 3,000 entities had their accounts frozen due to outstanding payables to the Social Insurance Agency and a further 5,418 legal entities had their accounts frozen due to outstanding payments to the General Taxation Authority of Mongolia. Not surprisingly, these outstanding payments are having a negative impact on the Government. Year to date fiscal revenue has fallen short by approximately 500 billion MNT (250 million USD) hence the GTA must be feeling pressure from the Ministry of Finance to collect taxes. This move, will likely add to the deteriorating employment conditions in Mongolia. Currently the Social Insurance Agency is paying approximately 2 billion MNT per month for unemployment benefits. In 2012, this figure was around 200 million, or 10% of the current outflows. At the end of Q2 2015, there were about 120,000 legal entities registered and operating in Mongolia. Budget cuts threaten political employment. The 2015 budget was approved with 7.16 trillion MNT in revenue (29.8% of GDP) and 7.60 trillion MNT in expenses (31.7% of GDP). Simple math tells us that the planned and approved fiscal deficit was supposed to be 439.2 billion MNT (or 1.8% of GDP). At current levels, it's more likely that revenues will reach 6.00 trillion MNT not the 7.16 trillion that had been planned. The resulting deficit will be approximately 900 billion MNT, approximately 3% of GDP. To facilitate this, the current budget must be amended in order to decrease the fiscal deficit to a more manageable level. The question is: "Where will the cuts come from?" We share the view that layoffs are eminent for the GoM. The Minister of Finance is already proposing to eliminate deputy minister posts from the Government, while eliminating 2-3 Government agencies through mergers with similar agencies. Мost notably, is the GoM's plan to eliminate 6 ministries and operate with only 9 from the beginning of 2016. But, that said, ministries and deputy ministers aren't the only ones under threat. The likely outcome of the current budget conditions and the state of governance also threatens the current political landscape and its stability. With a parliamentary election only 8 months away, the Democratic Party is looking more fragmented with various interest groups and fractions forming. We'll analyze the political landscape and different factors affecting Mongolian politics next week. If you have any comments or questions about the content this week don't hesitate to get in touch. PS: If you haven't already signed up follow the link below. 1. This Public Financial Management Performance Report (PFM-PR) is the first assessment of Mongolia's PFM system using the Public Expenditure and Financial Accountability (PEFA) framework.1 The report aims principally to establish an objective baseline measure of current PFM performance, highlighting areas of absolute and relative strength and weakness, thereby enabling a stock-taking of over a decade of PFM reforms in Mongolia and guiding the Government in its reform priorities. 2. Comprehensiveness and transparency: The budget and the fiscal risk oversight are comprehensive and fiscal and budget information is accessible to the public. 3. Policy-based budgeting: The budget is prepared with due regard to government policy. 4. Predictability and control in budget execution: The budget is implemented in an orderly and predictable manner and there are arrangements for the exercise of control and stewardship in the use of public funds. 5. 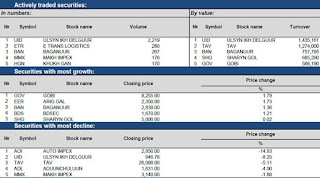 Accounting, recording and reporting: Adequate records and information are produced, maintained and disseminated to meet decision-making control, management and reporting purposes. 6. External scrutiny and audit: Arrangements for scrutiny of public finances and follow up by the executive are operating. 3. Against these six core dimensions of PFM performance, the set of 28 high-level indicators measure the operational performance of the key elements of Mongolia's PFM systems, processes and institutions of the budgetary central government. In addition, the PFM-Performance Report (PR) uses the indicator-based analysis to develop an integrated assessment of the PFM system against the six critical dimensions of PFM performance and evaluate the likely impact of PFM weaknesses on the three main budgetary outcomes of aggregate fiscal discipline, strategic resource allocation, and efficient service delivery. After two webinars on the South African Child Support Grant and the Uruguayan Family Allowances, the 3rd webinar of the Series is dedicated to Mongolia's Universal Child Allowance Programme. In this third presentation, Ms. Lakhagvasuren Munkhzul (Director of the Social Protection Department in the Ministry of Population Development and Social Protection, Mongolia) will present the Child Money Programme experience and future plans. Mr. Bjorn Gelders (Senior Social Policy Specialist, Development Pathways) will discuss the presentation. Ms. Judith Bruno (UNICEF Mongolia Deputy Representative) will serve as the moderator. • Which are the advantages and disadvantages of targeted vs. universal child allowance programmes? • Why did Mongolia decide to adopt a universal approach? • On which institutional framework is the programme built? Mongolian Mining supply company is looking for long term reliable suppliers from UK. October 1 (UKTI) Mongolian Mining supply company is looking for supplier of following products from UK. October 13 (UNWTO) UNWTO has launched a new ST-EP project in Mongolia, titled Capacity Building for Tourism Employees. The project has as objective to build capacities among tourism employees and unemployed young people to make a career in the tourism sector. The project is implemented with a generous contribution from the UNWTO ST-EP Foundation, and in collaboration with the Ministry of Culture, Sports and Tourism of Mongolia, the Sustainable Tourism Development Centre of Mongolia, and the CBI (Centre for the Promotion of Imports from developing countries), an agency of the Netherlands Ministry of Economic Affairs. Based on a needs assessment among private sector operators, the project stakeholders are preparing detailed curricula with training modules and manuals for training seminars that will be delivered in the low season to select tourism employees, who have the ambition and potential to advance their career in the tourism sector, as well as to unemployed young people who are looking for opportunities to enter the sector. Training seminars will be delivered on two different subjects: "tourism service and hospitality" and "tourism management". Upon completion of the curricula, local trainers will be selected who will first attend a train the trainer course before starting delivering the seminars. The new training seminars will be announced at tourism sector websites, and participants will be identified and selected in collaboration with the Tourism Department of the Ulaanbaatar City Administration and the Mongolian Hotels Association. The target of the project is to provide training to 200 people in 2016, at least half of them being women. In order to measure the results of the training, the project will carry out surveys among the participants who have completed the seminars to assess how the training has helped to enhance their skills and experience, and to gain economic benefits from making a career in the tourism sector. October 16 (gogo.mn) Residents are enabled to ride bus from Ulaanbaatar to Zamiin-Uud starting tomorrow at "Bayanzurh" transport hub. Below is the schedule of the buses. Tickets are available at Bayanzurh and Songinohairhan transport hubs and ticket offices of Narantuul market and Railway Station. Tickets are able to be sold 30 days in advance. October 16 (gogo.mn) Head of City Council D.Battulga received delegations led by the President of Taiwanese San Shi tourism company Mr. Chen Hong Fu and Deputy Director of the Business Department of Taiwanese Metallurgical Industry Mr.Chen and the parties exchanged views on further cooperation. At the beginning of the meeting, Head of City Council D.Battulga stated that I am grateful for cooperation between Ulaanbaatar and Taiwan developing from year to year. In scope of the 800th birth anniversary of Kublai Khan, book titled "Mongolian history and cultural heritages at Taiwanese National Palace Museum" has been released. It is very good that many findings affiliated to Mongolian history are being preserved at Taiwanese National Palace Museum. In the future, Ulaanbaatar and Taiwan will cooperate in many sectors especially in tourism sector. The President of Taiwanese San Shi tourism company Mr. Chen Hong Fu said that I am planning to establish Mongolian Amusement Park at Taiwan and we need UB city assistance for that project. Head of City Council D.Battulga thanked for the establishment of park, which enables Mongolian history, culture as well as traditions and he promised to cooperate and support. BEIJING, Oct. 16 (Xinhua) -- Parliamentary leaders of China and Mongolia met on Friday and pledged to enhance parliamentary exchanges between the two countries. China and Mongolia should fulfil the consensus reached by state leaders, strengthen mutual trust, enhance exchanges between political parties and parliaments, and implement big cooperation projects and people-to-people exchange plans to promote bilateral friendship, said China's top legislator Zhang Dejiang. Zhang, chairman of the Standing Committee of the National People's Congress (NPC), told Chairman of the State Great Hural of Mongolia Zandaakhuu Enkhbold that the NPC will strengthen its relationship with the Great Hural and prepare the first meeting of the bilateral parliamentary exchange mechanism. Enkhbold said Mongolia's State Great Hural attaches great importance to exchanges with the NPC, and is ready to enhance their cooperation through regular meetings and exchanges. Enkhbold was in Beijing to attend the Asian Political Parties' Special Conference on the Silk Road. Ulaanbaatar, October 16 (MONTSAME) Head of the parliamentary Standing committee on social policy, education, culture and science D.Battsogt Friday received Mr Xing Haiming, the Ambassador Extraordinary and Plenipotentiary of the People's Republic of China to Mongolia. Expressing a satisfaction with meeting the Ambassador, Battsogt said Mongolia is thankful to China for rendering non-refundable aid and support to the social sectors of Mongolia, and pointed out that the government decided to repair the western region's center of diagnosis and medical treatment with a financing from China. He asked the Ambassador to pay attention to this matter. In response, the Ambassador thanked the Standing committee head for the audience and said he will convey the matter to related officials and give a response. As the president of Mongolia's Association of Meat, Mr Battsogt said he is ready to provide the Ambassador with information about meat export and to collaborate with China in it. October 16 (MONTSAME) On the sidelines of his state visit to Mongolia, the President of the Federal Republic of Germany Mr Joachim Gauck visited Thursday Gandan Tegchilen temple which is the largest and most significant monastery in Mongolia. Hamba Lama of Gandantegchilen Monastery D.Choijamts has paid courtesy call on President of Germany. Then Mr Gauck lit a candle to the Janraisag. After that, Germany's President has attended German-Mongolian Institute for Resources and Technology /GMIT/. The Institute aims to transfer international expertise and cutting-edge standards to Mongolia in support of sustainable economic growth. In September 2013, the Institute welcomed its first 40 students, who enrolled in a one-year preparatory study programme in engineering. Since September 2014, three bachelor programmes have also been available in the subjects of mineral resources engineering, mechanical engineering and environmental engineering. Ulaanbaatar, October 16 (MONTSAME) The President of the Federal Republic of Germany (FRG) Mr Joachim Gauck finished his state visit to Mongolia on Friday. It is considered the German President's visit has a big importance for the Mongolia-Germany comprehensive partnership relations and in activating the cooperation in the economy, defense, culture, education and scientific spheres. During official talks and meetings, Mr Gauck highly spoke Mongolia's democracy and expressed a readiness to continue supporting the Mongolian democracy. Furthermore, he affirmed his country's willingness to broaden the bilateral ties and to back the archeological cooperation running under auspices of the two countries' Presidents. In frames of the visit, the sides signed documents on expanding the bilateral cooperation in the scientific sector. A cooperation memorandum has been established between the private sectors of the countries in the mineral sector as well. Ulaanbaatar, October 16 (MONTSAME) After the press briefing on Thursday, the Presidents of Mongolia and Germany had photographs taken with the Mongolian servicemen and the trainers from German Bundeswehr (Federal Defense Forces), who had served together in the NATO's International Security Assistance Force (ISAF) in Afghanistan. Mr Joachim Gauk, the Federal President of the Federal Republic of Germany, has highly spoken of the peacekeepers from Mongolia, saying "Bilateral political relations, in particular the cooperation in peacekeeping operations, are to be dearly recognized. For actual instance, Mongolian and German forces have been successfully serving shoulder-to-shoulder in the peacekeeping operations in Afghanistan". The head of state of Germany left Ulaanbaatar this afternoon, having concluded the state visit to Mongolia on October 14-16. Ulaanbaatar, October 16 (MONTSAME) A meeting-discussion-training ran Thursday at the Ministry of Foreign Affairs on realizing recommendations for the human rights status. Co-organized by Mongolia's Ministry of Foreign Affairs, the "UPR info" international NGO, the UN Permanent Representative Office and the Open Society Forum, the event brought together 70 servants and representatives of all Ministries, related agencies, the Parliamentary Office, the State Supreme Court, the General Prosecutorial Office, the National Commission for Human Rights (NCHR), NGOs on human rights. The "UPR info" NGO introduced to the gathered essential understanding about regular discussion of human rights status and good experiences of other countries, while the Forum of human rights NGOs presented them proposals on governmental measures for realizing the human rights recommendations, the criteria for evaluating the recommendations' implementation and necessary measures. The Ministry of Foreign Affairs said it intends to reflect in the governmental action plan the recommendations' works, expected results, measures, terms and concerned services. The Ministry also plans to set up a non-staff committee in charge of controlling the recommendations' implementation, with representation of the NCHR and civil society organizations, and to deploy human rights specialists in all Ministries and agencies. Every member of the United Nations discusses its status of human rights every 4-5 years at the United Nations Council for Human Rights (UNCHR) and takes promises to realize recommendations from other countries. Mongolia discussed its first ever report on human rights in November of 2010, and the second report was discussed successfully in May this year. Within the discussion of the second report, Mongolia accepted 150 recommendations out of 164 offered by 64 countries. Ulaanbaatar, October 16 (MONTSAME) Mongolia and Kyrgyzstan have exchanged views on opportunities to expand their friendly relations and trade, economy and humanitarian cooperation, at a consultative meeting. The meeting between the two Ministries of Foreign Affairs ran Wednesday in Bishkek of Kyrgyzstan, co-chaired by Mr D.Gankhuyag, the State Secretary of Mongolia's Ministry of Foreign Affairs, and by D.A.Kemelova, the First Deputy FM of Kyrgyzstan. During the meeting, the parties shared information on a planned visit of Kyrgyzstan's President to Mongolia, the biggest goals of Mongolian foreign policy such as a decision to maintain a permanent status of neutrality, taking support from Kyrgyzstan at the 2015 election of the United Nations Council for Human Rights (UNCHR) and having Kyrgyzstan joined the International Think-Tank for Landlocked Developing Countries. Mr Gankhuyag congratulated Kyrgyzstan on successful organization of the parliamentary election October 4, and affirmed a readiness of Mongolia to share its experience with Kyrgyzstan in democracy, open society and lessons of free-market economy. After meeting, Gankhuyag attended opening ceremonies of the General Consulate of Mongolia in Bishkek and of Mongolian film days. Ulaanbaatar, October 16 (MONTSAME) The first political consultative meeting between the Ministries of Foreign Affairs of Mongolia and Tajikistan took place in Dushanbe of Tajikistan on October 12. State Secretary at Mongolian Ministry of Foreign Affairs D.Gankhuyag met with the FM of Tajikistan Aslov Sirodjidin, and run the consultative meeting together with Zohidi Nizomiddin Shamsiddinzoda, the vice FM. The sides addressed matters of friendly relations, strengthening the legal basis for forwarding trade and economic relations, as well as regional and international issues of interest. They also agreed to commence cooperation of the chambers of commerce and industries and to exchange cultural events. The Mongolian side highlighted key foreign policy objectives of Mongolia, including the recent decision to adopt permanent neutrality, touching upon matters of getting Tajikistan's support on the Mongolia-initiated UN General Assembly draft resolutions and on Mongolia's candidacy in UN Human Rights Council, as well as Tajikistan's joining the Agreement on International Think-Tank for Landlocked Developing Countries, to be based in Ulaanbaatar. Ulaanbaatar, October 16 (MONTSAME) Ambassador Extraordinary and Plenipotentiary of Mongolia to the Kingdom of Thailand T.Togsbilguun paid a courtesy call on General Prayut В Chan-o-Cha, the Prime Minister of the Kingdom of Thailand, on Thursday at the Government House in Bangkok, in connection with the assumption of his official duties as Mongolia's Ambassador to the country. The news was reported Friday by the Foreign Ministry of Mongolia. Mr Togsbilguun conveyed greetings from Mongolia's Premier Ch.Saikhanbileg to his counterpart of Thailand and emphasized the important role of official visits, paid by Her Royal Highness Princess Maha Chakri Sirindhorn to Mongolia in 1992 and 2009, in successful development of friendly relations between the two countries. He also said the two sides agreed to set up intergovernmental Consultative Body on Bilateral Cooperation as a result of the visit of PM of Thailand to Mongolia in 2013, and proposed convening its first session in early 2016. The Prime Minister of Thailand congratulated Togsbilguun on assuming his official duties and expressed his country's readiness to cooperate with Mongolia in realizing the issues discussed during Thai Premiers visit to Mongolia in 2013. The sides noted with a mutual satisfaction an excellent tradition of supporting each other within the United Nations as well as other international and regional fora, and agreed to resolve to strengthen this cooperation. Present at the meeting were diplomats from the Mongolian Embassy in Bangkok; General Wilas Aroonsri, the Secretary-General to the PM of Thailand; Mr Vitavas Srivihok, Deputy Permanent Secretary of the Ministry of Foreign Affairs of Thailand; and other officials. Ulaanbaatar, October 16 (MONTSAME) The Mongolian Minister of Labor G.Bayarsaikhan has participated in the G7 Employment and Development Ministers Meeting which was October 12-13 in Berlin, Germany. Representing the government of Mongolia, the Minister has attended the Meeting as the special guest invited by the G7. This time, the Meeting ran under an initiative called "Cooperation for sustainable network of supply and sales". Mongolia's current policy on supporting labor has attracted attention of the G7 participants, said Mr Gerd Muller, Germany's Federal Minister of Economic Cooperation and Development, at the Meeting. In his speech, Mr Bayarsaikhan noted that Mongolia joined the International Labor Organization (ILO) in 1968 and that Mongolia has become one of the first Asian countries to join the 17 international conventions on labor, including the eight basic conventions of the ILO, "in 2015, Mongolia enrolled to the ILO 88th Convention on employment services and the 181st Convention on private services of employment". Mr Bayarsaikhan underlined an importance of supporting appropriate labor with the network of sustainable sales and supply, and said Mongolia appreciated requirements for improving the legal environment for labor, working situation and effectiveness, augmenting job places and developing the social partnership. Our parliament is discussing a draft new version of the labor law which aims to expand the labor relations and range, and to regulate essential rights in job places, the right on uniting, abolishment of child labor and banning forced labor. He hoped that the G7 Employment and Development Ministers Meeting will play a vital role in broadening the initiative of supporting appropriate labor with the network of sustainable sales and supply and boosting international collaboration. October 18 (Business Insider India) It all started with the 5th Director General level talks between the Border Security Force of India and General Authority for Border Protection (GABP) of Mongolia which held from 17th Aug 2015 and 21th Aug 2015 at Mongolia. Programs for the Officers of GABP for Border Protection of Mongolia. Reciprocal training of BSF Officers by GABP Mongolia for Training/ Courses. Under this newly formed cooperation, two separate teams of five Mongolian officers of Mongolian Border Defense force had started their training with the Indian BSF at Indore and Hazaribagh. A capsule course for Sniper training was organized at Indore and Bomb-Squad & Jungle warfare training was organized at Hazaribagh center. As a defence and Central Asia expert, I got a chance to be a part of this training which ran from 7TH -18TH September 2015. The Mongolian Sniper training delegation at Indore was headed by Capt. Manlai Bayaraa. Arrival of Mongolian officers at Central school of Weapons and Tactics. Growing Indo-Mongolian defence ties reflects the new era of the foreign policy as India is inching closer to the central Asian nations and tries to be a part of their third neighbor policy and it also counters the Chinese influence in that region. Ulaanbaatar, October 16 (MONTSAME) On Thursday, Minister of Health and Sports G.Shiilegdamba took part in the weekly meeting "Hour of Minister", and gave information on the Hepatitis C cases, prevention actions and treatment in Mongolia. Each year, there are 130-170 million people who have Hep-C infection, moreover, 3-4 million get infected and 350-500 thousand people die. A recent study shows, in Mongolia, some 400 thousand people with Hep- A,B,C,D infections, which bring our country to the top of the list in terms of virus prevalence. In frames of improving treatment of Hepatitis C virus in Mongolia, 140 doctors and specialists have received required trainings. A campaign of virus quantification tests has been running. Out of the total 2,500, who gave the test, 1,300 were diagnosed with Hep-C. The Harvoni medicine will be sold in 22 guaranteed pharmacies, said Minister G.Shiilegdamba. Ulaanbaatar, October 16 (MONTSAME) A memorandum of understanding has been established between the Ministry of Education, Culture and Science and the National Union for People with Impaired Vision (NUPIV). The memorandum was signed on Thursday by L.Gantomor, the Minister of Education, Culture and Science; D.Gerel, the president of the NUPIV; and M.Bayasgalan, head of the Center of Education, Development and IT for People with Disabilities. In accordance with the document, the sides will launch collaboration in providing people with impaired vision with appropriate educational services, ensure rights of education for the disabled, improve the learning environment for them. Moreover, works will be done to publish textbooks in Braille for the people and to create special software for online library. October 13 (UNICEF Mongolia) Every year on October 15 we celebrate the International Day for Disaster Reduction (IDDR) worldwide. On this day we are reminded and encouraged that every citizen and government to take part in building more disaster resilient communities and nations. Mongolia is no stranger to disasters. The most common ones are dzud (long harsh winters which leads to loss of livestock), droughts, floods, storms, wildfires and extreme temperatures. The most recent being 2009-2010 dzud during which about 8.5 million livestock had died, approximately 20% of the country's livestock population, affecting 769,000 people or 28% of Mongolia's human population. With climate change in sight, such events are forecasted to be more frequent and with high intensity. Hence it is important to better prepare for response but more importantly, to work towards mitigation and Disaster Risk Reduction. The effects of disasters are not only felt on human lives but its impact economy and infrastructure could also indirectly affect the population of the country. According to World Bank survey, every $1 spent on DRR can save $7 which would be spent on response. Mongolia has taken big strides towards strengthening the coherence between DRR, climate change and sustainable development. A Sendai Framework for Disaster Risk Reduction was held in Sendai, Japan this year which clearly outlines the targets and priorities in this sector. Mongolian government was one of the first countries to show commitment to the Sendai Framework by inviting the head of UNISDR, Ms Margareta Wahlstrom, to the country for development dialogue focusing on building more resilient Mongolia. UNICEF realises that women and children are the most vulnerable during disasters. A study conducted by Faculty of Medicine, Tattori University, Japan, highlighted that the infant mortality rate was significantly correlated with declining rate in numbers of livestock (due to natural disasters such as dzud) and a decrease in milk products consumption. Other impacts on children due to climate change are mortality and injury from extreme weather events, increased risk of water scarcity, transmission of waterborne and food-borne diseases, declining livelihoods as noted earlier, disruptions in school attendance, heightened risk of food insecurity and child malnutrition. UNICEF is working to ensure that there is a response mechanism in place within the organisation to support the government in response to such events. UNICEF also supports National Emergency Management Authority (NEMA), government ministries and other counterparts in disaster risk reduction programmes and projects. Currently we are in infancy stage of our World Wide Initiative of Safe School (WISS) project where we are collaborating with Government, NEMA and other NGOs to launch a pilot in school which will be advocated to be implemented on a broader scale. Lastly, I hope on this day we all find little ways to make difference and find ways to better prepare for an emergency. Remember, every bit counts! June 11 (TEDxTalks) Bruce Elfstrom talks about his work bringing back the Mongolia Bankhar Dog to protect the livelihood of Mongolian farmers and breeders. Bruce Elfstrom is a biologist by training, and an explorer and outdoorsman by profession. Born to an American documentary filmmaker father, and Swedish writer and UN employee mother, Bruce was born in New England and called home places ranging from Beirut Lebanon and coastal Maine. Logger, commercial fisherman, zookeeper and more, he established Overland Experts LLC, an expedition training business, in the late 1990 creating a job that allowed him to keep the adventure going. He first became aware of Mongolia's desertification and conservation problems on a trip to the Mongolian steppe in 2006. Discovering several families still using original. While spending most of his working time training groups as diverse as Navy Seals to Red Cross, Bruce began a non-profit organization after running an IMAX film in Mongolia. Bruce founded Mongolian Bankhar Dog Project in 2011 to put his varied knowledge to practical use. Mongolian Bankhar Dog Project is a USA 501(c)3 non-profit that researches, breeds, and trains Mongolian Bankhar livestock protection dogs and places these working dogs in homes of nomadic herding families on the Mongolian steppe. Here, the Bankhar perform their traditional role of protecting livestock herds (sheep, goat, horse, camel, yak) against large carnivorous predators including snow leopards, wolves, brown bears, foxes and eagles, in an effort to end human-carnivore conflict in this region. Equally as important is helping to protect the endangered snow leopard and the local Mongolian wolf populations! Bankhar dogs are one key to snow leopard conservation. Snow leopards and other carnivores can decimate livestock herds overnight. Herders feel that they have no choice but to exterminate these precious creatures. Bankhar livestock protection dogs scare off the leopards and make lethal intervention unnecessary. That seems like a win-win-win for nomadic herders, snow leopards, and livestock. We are running an Indiegogo campaign to crowd-fund our operating expenses for 2016-17. Your support for our project is vital. We can't continue our programs without raising these funds – and we are looking to our community to join us on this amazing adventure. We are looking to the people who care about us, our dogs, and the possibility of improving the environment, despite bleak predictions about almost every facet of environmental degradation in Mongolia. ELEVEN Diamonds fans travelled 4000 miles to the Asian country to build homes, hand over medical supplies and play football. October 17 (Daily Record) A FANTASTIC experience we will never forget. That was the reaction of the Airdrieonians Supporters' Trust members after they returned home from their mission to Mongolia. Our Diamond geezers travelled 4000 miles to the Asian country to build homes – gers – for the poor, hand over medical supplies and play football. The 11-strong group touched down in the capital city of Ulaanbaatar for the start of their epic 10-day adventure. And trust chair Willie Marshall admitted: "It was amazing." Catherine Arnold – the British Ambassador to Mongolia – hosted the group and presented them with a plaque to mark their match with national champions Khoromkhon. However, it was the friendliness and hospitality of the folks living in harsh conditions outside the capital which knocked the trust lads for six. Willie added: "None of us have ever experienced anything like that before. The people were so nice. "They were friendly and would open up their home to you. The city is busy but it's different beyond there. "We met people who were getting ready to move to another area so their herd had food for winter. You lived alongside the villagers. One night we pitched up in a ger and went to this woman's ger next door with food and she cooked dinner for us. We went to one place which was only 100 kilometres from the border with Russia. I have travelled a fair bit but this was the best experience I've ever had. It was humbling." The group raised enough money to build four gers which were dished out to families in need by Mongolia's social services staff. A match was arranged with a Mandalgovi Select and, before kick-off, the tannoy announcer told the small crowd about the trust's work. Two of the families receiving gers had been invited along and were handed the microphone to express their gratitude. Willie said: "That was the most emotional day for us." Medical supplies were given to Mandalgovi Hospital and Khoromkhon FC were given kit for their youth teams. There is some cash left over and the trust will meet to decide how it is spent. Building on the good work done in Mongolia is the priority and the money could be used for another ger, shelter at Mandalgovi's football facility or to fund a Mongolian student's university place. "Everybody got into the spirit of things," commented Willie. "We really enjoyed ourselves." And an explanation for the 11-3 defeat to Khoromkhon who lifted the Glengoyne Cup supplied by MacLeod Distillers? "We were doing the diplomatic thing," laughed Willie. October 16 (gogo.mn) Today P.Tsagaan, Head of the President's Office, received Japanese representatives led by Kotaro Tekemura and exchanged views on preparation for 3rd Asia-Pacific Water Summit, which will be held in Ulaanbaatar on May, 2017. Mr. Kotaro Tekmura recommended to start drawing attention to summit preparation by establishing organizing committee and solving financial and budget issues through the Ministry of Foreign Affairs in order to organize high-level summit. Head of the President's Office Mr. P.Tsagaan emphasized that Mongolia will be responsible for the organization of the summit and has been paying close attention to water issue. Recently President's Office in cooperation with Sustainable Development Project has organized the lecture titled "Water Governance", he stated. (U.S. Embassy, Ulaanbaatar) On September 28-October 2, the U.S. Embassy brought the Institute of Journalism and Natural Resources (IJNR) founder and former Wall Street Journal reporter, Frank Allen, to Mongolia for a series of meetings, public lectures, and environmental journalism trainings. Mr. Allen's visit was part of the U.S. Department of State's Bureau of International Information Programs' (IIP) U.S. Speaker program. During his visit, Mr. Allen met with the Media Council and professors from the Department of Journalism of the University of Humanities of Mongolia, participated in a roundtable discussion with the Environmental Journalists Club of the Press Institute of Mongolia, held a workshop with Mongolian journalists and students, delivered a presentation at the University of Humanities titled "Opportunities for Covering the Environment," and gave a public talk at American Corner in Ulaanbaatar titled "The Environment Beat in America". Media Council board member Gunjidmaa Gongor commented, "We were pleased to discuss journalism ethics and media responsibility with Mr. Allen. We believe that responsible and independent journalists will be on the frontline to strengthen democracy in Mongolia." The goal of the program was to enhance the ability of Mongolian journalists to analyze and report on natural resource and environmental issues. During his meetings with journalism professionals and students, Mr.Allen offered advice and described the unique challenges inherent to environmental news reporting, the ethical issues facing Mongolia's journalists, and the difficult and complex environmental stories he reported on during his 40-year, journalism career in U.S.
Each year the U.S. Department of State's Bureau of International Information Programs (IIP) organizes around 1,300 traveling and electronic events for American experts to engage with foreign audiences worldwide. To learn more about IIP and their programs, click here. In 2009, The Nature Conservancy in Mongolia identified eight critical grassland species and habitats. Today, the only key species in decline is the marmot. The population of marmots has decreased to less than 10% of its 1990 estimate of 40 million. We knew we had to do something to save the marmots before they were gone for good, and we knew we wanted to do something fun. So, we organized an awareness campaign, "Humans, please love me," aimed at local governments, herders, communities and kids. To focus on kids, our most powerful weapon for conservation, we visited schools where kids learned facts about marmots with fun games, puzzles, quizzes and tongue twisters. The activities taught the kids about the biological importance and value of the species. For the communities, the Conservancy held entertaining programs with dancing, sport tournaments, singing, and marmot Q&A games to convince people protect marmots. The participants also took an oath not to hunt marmots and to be role models in their communities. To spread the word on marmot conservation in small towns, we used the tried-and-true method of going door-to-door. We handed out poster-format calendars and marmot stickers. While traveling from town to town, we stopped by some herder families in rural areas for interviews and discussions about marmot conservation. As always, we were warmly welcomed into their gers to share stories about wildlife and hear the herders' passion for their natural resources. We also met with local government, officials and rangers and presented at town hall type meetings. During these meetings, the Conservancy showed a short presentation with monitoring data on the decline of marmots and discussed how the towns would organize their own marmot conservation campaigns. To help these efforts, we prepared a large banner for each town with its name and the campaign slogan, "Humans, please love me." The good news is that marmot conservation was positively received and people are very aware of the declining populations. Local herders have always hunted marmots for their tasty meat, but the dramatic decline is attributed to demand from the Chinese fur trade. Marmot hunting was declared illegal in 2009, but poaching is still widespread with populations decreasing 45.8 times since 2010. Marmots are a critical species for grassland ecosystems, because they dig tunnels that help aerate the soil and spread nutrients. Also, marmots are an important source of food for grassland predators such as wolves and falcons. If predatory animals lose their food supply, they will leave. Predators are necessary for eliminating ill gazelles that can spread disease to livestock, affecting herders' livelihoods. Community participation is critical for all of the Conservancy's work in Mongolia. We met one family, Nyamkhand and his wife Borkhuu, who have already been proactive by declaring and enforcing a marmot moratorium in their community. Bayasgalan, whom we met on the street, was so concerned about marmot populations that he brought some from another region to repopulate the area near his summer ger. He reports the marmots appear to be doing well and repopulating. The Nature Conservancy is very fortunate to have good relationships with local families who help us with our work, such as observing wildlife, recording species seen, and acting as surrogate rangers. Without these symbiotic partnerships, marmots and other critical species would be here today but gone tomorrow. See more in a marmot conservation slideshow. October 14 (Daily Mail) The remains of a litter of 'duckbilled' dinosaurs have been discovered in an area known as the Dragon's Tomb in Mongolia. Scientists say the specimens were found close to fragments of eggshell and that the 'babies' were probably in the earliest stages of development. They believe the creatures belonged to a group of Saurolophus angustirostris - a type of giant hadrosaur - and that they are all likely to be from the same nest. Scientists described three or four perinatal specimens - or 'babies' - and two associated eggshell fragments. They said the young dinosaurs were likely part of a nest originally located on a river sandbank. Scientists are not sure whether the individuals were still in the eggs or had just hatched when they died, but they were dead and partly decomposed when they were buried by river sediment during the wet summer season. Dragon's Tomb, in the Nemegt basin in the northwestern Gobi Desert, is a well-known location for finding Late Cretaceous dinosaur fossils. Leonard Dewaele, of Ghent University and the Royal Belgian Institute of Natural Sciences, said the skull length of the Saurolophus found was around five per cent that of the largest known S. angustirostris specimens, indicating that they were in the earliest development stages. But the bones already resembled S. angustirostris characteristics, including the upwardly directed snout also known as premaxillary bones. Dewaele said the specimens did not yet have the characteristic cranial crest at the top of the head and areas of the skull - the cervical neural arches - were not yet fused, which suggest they may be in the earliest stages of the development. He added: 'The poorly developed crest in Saurolophus babies provides evidence of ontogenetic crest growth within the Saurolophini tribe. He said the fossilised eggshell fragments associated with the specimens closely resemble those found from S. angustirostris relatives in Mongolia, and suggested they may bridge a gap in our knowledge of the development of S. angustirostris. October 15 (Smithsonian Magazine) One of the hottest debates surrounding the dinosaurs is temperature: Were these "terrible lizards" who stalked, tromped and flew around the ancient world​ warm or cold blooded? A new study of dinosaur eggshells​ supports a third option—both. Since eggs grow their tough calcium carbonate shells inside their mother's body, looking at the chemical structures of those eggs can give scientists clues about the critter's temperature, according to the study recently published in the journal Nature Communications. Researchers analyzed eggshells from two groups of Cretaceous dinosaurs. One set of eggs belong to the behemoth titanosaurs—a group of long-necked herbivores that included the familiar Brontosaurus. The other eggs belong to the bipedal, omnivorous oviraptorid, which are smaller and more bird-like. Scientists can estimate the body temperature by looking for bonds between rare isotopes of carbon and oxygen (carbon-13 and oxygen-18) in the calcium carbonate minerals that make up eggshells, Rachel Feltman reports for The Washington Post​. More of those bonds means the eggshell formed at a cooler temperature in the mother's body. This egg analysis suggested that tintanosaurs ran at a hot 99.7 degrees Fahrenheit, while the oviraptorid chilled at a cooler 89.4 degrees. But to tell if they were cold-blooded or warm-blooded scientist also needed to know the temperature of their environment. The terms cold-blooded and warm-blooded are actually misnomers and are more properly termed ectotherms and endotherms. Like lizards warming in the sun, ectotherms need external heat sources to regulate their body temperatures, while endotherms generate their own heat through metabolism, explains a press release from the National Science Foundation. So to tell where the animals got their heat scientists examined fossilized soils that surrounded the eggs in present-day Mongolia and Argentina, which showed ancient temperatures of roughly 79 degrees Farenheit. Both dinosaurs were warmer than that, which could mean possible endothermy, but since the temperatures are so different, the researchers think a middle of the road approach was likely. "This suggests that maybe they were warm blooded, but hadn't developed the high level of temperature regulation seen in mammals and birds today," lead study author Robert Eagle, of the University of California, Los Angeles, tells The Post. "They were kind of part way to evolving endothermy." That puts dinosaurs in class with the catchy moniker mesotherms. Animals that subscribe to this strategy can generate and regulate their own body heat but don't maintain as constant a temperature as mammals do. Modern animals including tuna, lamnid sharks and leatherback turtles are mesotherms, reports Alexandra Witze for Nature. Modern birds do fall squarely in the endotherm territory, with fast metabolisms and warm body temperatures to match. Since birds are the descendants of creatures like the oviraptoid, the researchers think their method might help track the evolution of endothermy in dinosaur lineages. As far as the dinosaur temperature debate goes, the results sound like a good compromise. October 14 (Snow Leopard Trust) The Snow Leopard Trust has been surveying Mongolia's Tost mountains with remote-sensor research cameras for many years in order to monitor the area's snow leopard population. These cameras have also taken hundreds of photos of other species that share the same habitat, such as the Pallas' cat – a small feline that is as elusive as the snow leopard, but even less well understood. We are excited to now share and analyze this valuable data in collaboration with the Royal Zoological Society of Scotland, and Sweden's Nordens Ark Zoo. In 2008, the Snow Leopard Trust launched the first-ever long-term study on snow leopard ecology in the Tost Mountains in southern Mongolia to address critical knowledge gaps for this elusive cat that is often referred to as the ghost of the mountain. Remote-sensor camera surveys have been an integral part of this study from the very beginning. Nordens Ark has been an important partner of the study in the Tost Mountains since 2011. Starting this year, we have expanded this collaboration to include research on the smaller and equally elusive Pallas' cat– a species whose ecology is virtually unknown, which has led our researchers to affectionately call it the 'small ghost of the mountain'. The expansion to include research on Pallas' cats also includes a collaboration with the Royal Zoological Society of Scotland and their connection with the Pallas Cat Working Group. By using the network and logistical support of Snow Leopard Trust and the expertise on Pallas' cats at Royal Zoological Society of Scotland, we will maximize the conservations efforts and use the resources in a way that that will benefit both species. "Pallas' cats are one of the least studied cats in the world and there is a large need for information on which to build conservation plans for this rare and elusive cat", says Gustaf Samelius, the Snow Leopard Trust's Assistant Director of Conservation. "The need for such information is illustrated by the fact that the distribution of Pallas' cats is still largely unknown and that Tost mountains, where we have photographed this feline isn't even included in current distribution maps", he adds. In 2014, Snow Leopard Trust researchers also found the Pallas' cat on several research camera photos from Sarychat Ertash nature reserve Kyrgyzstan – the first ever photographic proof of its presence in that area. "That's yet another sign that there's a lot of work to do for us to understand this cat", Gustaf says. The objectives of the new collaborative study on Pallas' cats are to help improve our understanding of the distribution and basic ecology of the species (e.g. association with other species) and to improve survey techniques by testing attractants to increase the likelihood of observing this rare and elusive animal. The work will be based on camera studies and interviews. The first step is to work with the existing camera data from the Tost Mountains to screen for Pallas' cats and to test animal recognition software as a means to screen the large number of photographs generated from camera studies (many of which may be blank of or "non-target" species such as goats and sheep). Building on the experience from previous (snow leopard) camera studies, we also hope to do a camera study focused on Pallas' cat in the Tost Mountains in the future. October 15 (Inside the Games) The Mongolian National Olympic Committee (MNOC) has signed a partnership agreement with the Japanese Olympic Committee ahead of Tokyo 2020, it has been announced. An MNOC delegation, led by President Demchigjav Zagdsuren, attended the ceremony to mark the signing, which aims to increase co-operation between the two Committees in the build-up to the Olympics and Paralympics in five years' time. JOC President Tsunekazu Takeda, who is a vice-president of the Tokyo 2020 Organising Committee, was also in attendance, as was 35-times sumo championship winner Mönkhbatyn Davaajargal of Mongolia, better known by the name of Hakuhō Shō. Davaajargal is an Olympic Ambassador for Tokyo 2020 and is regarded as one of the most successful sumo wrestlers in the history of the sport. It is hoped the partnership will help strengthen the relationship between the MNOC and the JOC. Mongolia's first appearance at the Olympic Games came at Tokyo 1964, where they failed to win a medal. Since then, they have won a total of 24 medals at the Games including two golds, claimed by Enkhbatyn Badar-Uugan in the men's 54 kilograms bantamweight boxing and Naidangiin Tüvshinbayar, who topped the podium in the men's under 100kg judo category. Both of those successes came at Beijing 2008, where they scooped four medals, a total which they had previously achieved in Mexico City in 1967 and in the Russian capital Moscow in 1980. They have traditionally done well in the combat sports including judo, boxing and wrestling although they have also won two Olympic medals in shooting. Mongolia had their most successful Olympics at London 2012, coming home with two silver and three bronze medals. October 16 (gogo.mn) The Mongolian State Academic Theater of Opera and Ballet will stage "Lucia di Lammermoor", a tragic opera by Gaetano Donizetti on October 17, 18 at 05PM for the first time. Korean producer An Hu Won has been working on the production of the opera. Interestingly, works of Italian composer Gaetano Donizetti have never been performed at the stage of Mongolian State Academic Theater of Opera and Ballet. For more information, please contact at 70110389, 99196609, 88044508, 99024933, 99194570. · Lucia - U.Urantsetseg who lives and works in Italy has arrived in UB to perform in opera as Lucia. She has been working in Italy since her graduation as opera singer. "Lucia di Lammermoor" is her first opera in Mongolia. October 15 (Vagabond Baker) Mongolia in October is spectacular! It is still possible to get out into the Gobi Desert. Those wide open landscapes look incredible in the clear October sunshine, think long shadows and golden afternoons. In Ulaanbaatar – the capital – you can prepare to head out into the desert. If you are lucky it may coincide with the celebrations for Chinggis Khan's birthday, it's a national holiday and there is some pomp and splendor. The date varies year to year – like Easter –, falling on the first day of the first winter lunar month. Many tours and drivers use old Soviet UAZ 4×4 mini buses. They often break down – which can lead to fantastic adventures – yet they are simple to fix. And there's no denying how cool they look! Accommodation in the desert is snug and nomadic. Mongolian 'gers' – ger is the Mongolian word for yurt – dot the landscape, moving with the seasons. Inhale the familiar smell of 'ger': a smell of farm, of old milk, of meat stewing, of the smoky scent of the dried dung used for fuel. The gers have dogs, to guard and herd the animals. They aren't always friendly: shout 'Call off your dogs!' when you near a ger! Don't imagine that the desert is dry and empty, these landscapes change and vary as you travel though them. There are stunning sand dunes that sing to you, vast grasslands that are alive with birds, geological wonders and dinosaur eggs – if you are lucky at the Flaming Cliffs. Don't worry, the ger is still warm. There are old temples – ornate and vibrant inthe emptiness. It's A Sad Day When You Have To leave. We visited Mongolia in October '13 as part of a longer independent overland rail trip to China from the UK, travelling on a small budget. To get out into the desert we booked a tour through the hostel we stayed at when we arrived (Sunpath). When booking our hostel in Ulaanbaatar we didn't check the accommodation reviews, we checked the reviews for the tours they did instead and based our stay on that. We joined up with three other people, two of which we'd travelled from Russia with, to make a small group of 5. Our tour comprised of one night at a tourist ger camp, one night staying with a family in their ger and 4 nights staying in private 'spare' gers. I'm a vegetarian and doing this as part of a tour meant I was able to eat – Mongolia is quite hard for vegetarians and vegans: meat and dairy are the only sustenance out on the plains. Our tour came with a guide and a driver, our young guide Badmaa cooked for us giving me the food before adding the meat for everyone else. It was a lot of pasta in various brothy guises. There are vegetarian restaurants and menu options in UB. In October the tourist ger camps were semiclosed and there was no running water, no running water anywhere. The only water we had on the tour was bottled water for drinking. This meant we didn't wash for 6 days! I would recommend packing dry shampoo and cleansing wipes.